An on-the-run prisoner has been updating his friends about life on the run via his Facebook page. 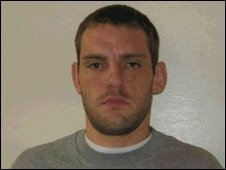 Police are trying to use clues left by burglar Craig Lynch, 28, on the social networking site to track him down. Lynch, who has links to Edgware in London, has updated his 248 Facebook friends about nearly crashing his car in icy weather and meals he has had. He absconded from Hollesley Bay open prison, near Woodbridge, Suffolk, in September. Lynch was given a seven-year jail term after being convicted of aggravated burglary and was serving time towards the end of the sentence at the open prison where he was allowed day release. Police have appealed to his friends on Facebook to tell them where he is. A police spokeswoman said officers dealing with the case were making detailed checks to make sure the man on the page they had identified is the wanted prisoner. "We are also using the information we have and anything that appears on his site to try and locate him. "I would appeal to anyone with information about his whereabouts to contact Suffolk Police," she said. A photograph on the page shows Lynch looking at the camera and holding up a finger in an apparent defiant gesture. A spokesperson for Facebook said it was aware of Lynch's page on its website and was working with Suffolk police officers to try and track him down.